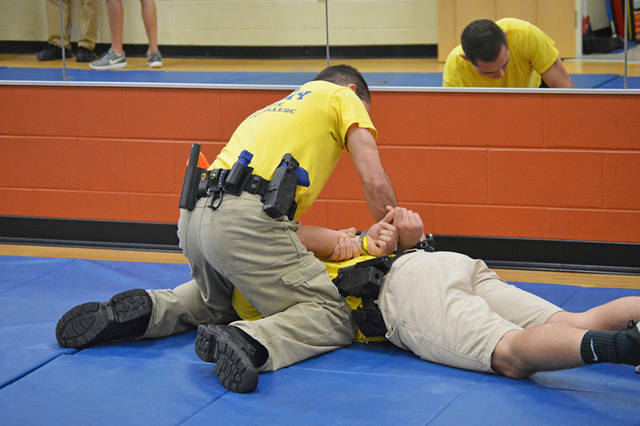 Edison State Police Academy cadets train during the Ohio Peace Officer Training Academy to prepare for a career in law enforcement. PIQUA – The Ohio Peace Officer Training Academy at Edison State Community College is accepting applications for the 23-week program that will prepare students for a career in law enforcement. Students of the program will meet for six days each week beginning in July and, upon successful completion, will graduate from the program in December. The curriculum of the program is certified by the Ohio Peace Officer Training Commission and covers all aspects of law enforcement training including administration, firearms, subject control and investigation. Completed applications must be received by May 28. Physical assessment tests may be completed on either from 1-4 p.m. May 30 or from 9 a.m.-noon May 31, with the academy running from July 8 to Dec. 21.